In my continuing crusade to make you all buy smokers, I’ve recently written a general primer about smoking meat, blogged about smoked salmon (which I maintain is the easiest and best meat to smoke for a beginner) and smoked turkey (which is one of the harder meats to smoke right, surpassed only, in my experience, by beef brisket and pulled pork, which I haven’t blogged yet). But second only to salmon for the winning combination of ease and tastiness is probably pork loin. To be clear, I’m not talking about the big, fat pork loin roast, but rather the longer and skinnier pork loin (frequently sold two at a time in a vacuum pack). Preparation is remarkably easy. Some people always cut off the “silver membrane”, and some don’t. I usually make an effort to get it off, but don’t kill myself trying. Really you can use any dry bbq rub, whether a spicy chili powder-based rub, or a sweeter rub with brown sugar in it. I’d let that sit anywhere between 3 hours and overnight to adhere nicely to the meat, and then put on a bbq sauce about a half hour before you take it off the smoker (I used to always put it on in the beginning, as seen in the pics below, but now I do it near the end instead)–once again going spicy or sweet, depending on how you rubbed it. You can even go just with the rub or marinade or just the sauce without going too wrong. I would think that some of the fruit glazes might conflict with the smoke, but you can choose what you want based on your own tastes. From there, it is as simple as smoking gets. 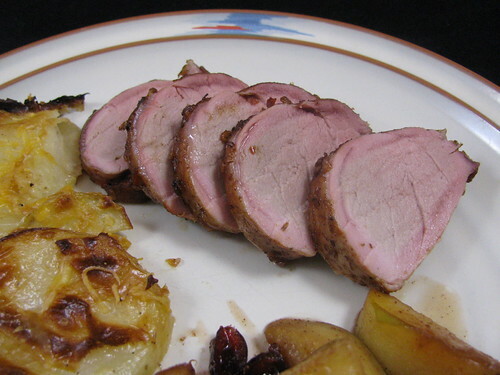 A 1 1/2 to 2 pound pork tenderloin will take about three hours, and since they usually come in packages of two, I usually do both together, with no additional cook time. For a three hour smoke, you will likely need to add new coals (and a few more chunks of wood) halfway through the cooking time, to keep up the heat, but you are very unlikely to have to add anything to your water pan. If you’ve kept the temperature at 220 or so, I can nearly guarantee it will be done by three hours. You can generally tell whether it is done based on the firmness of the meat, but those who like to follow safety standards and are using a meat thermometer (preferably one that constantly reads the temperature without having to open the smoker) can take it off when it hits between 150-160 degrees, and wrap it in foil on the cutting board for 5-10 minutes afterwards. If you did it right, it will still be pink! The pink around the outside is called the “smoke ring”, and it is prized for its appearance, tenderness, and taste. Slice it into quarter inch rounds, and you will have an amazingly tasty, tender, and very lean (for pork) treat. You can generally serve a family of 4 with one loin, and I usually save the extra to chop up for bbq pork sandwiches or to put into chili, but none of it has ever gone to waste. Pork Loin Sauced! NOTE: I usually sauce 30 minutes before taking off the smoker now. Pork Loin Sliced! Note the pretty pink smoke ring! Weight Watchers Info: 6 PointsPlus per 3oz serving, cooked, with marinade. 5 PointsPlus per 3oz serving, cooked, with dry rub. Cut silver membrane off pork loin, if you feel like it. 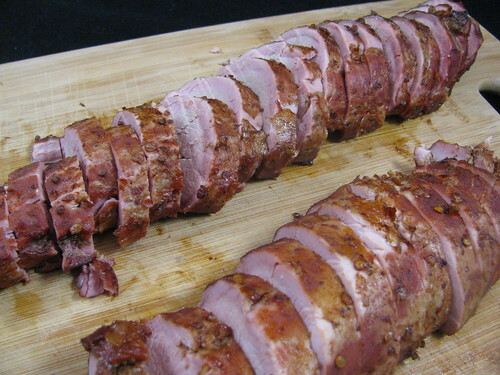 Marinade or dry rub pork loin (can be done overnight, but citrus based marinades should only be done 2-3 hours max). Drain marinade (if used) and place pork loin on smoker. Smoke approximately 3 hours at 225, replacing charcoal (and adding new wood chips) once, or as needed, to maintain temperature. About 30 minutes before taking it off the smoker, baste with BBQ sauce, if using. When the meat reaches 150-160 degrees, take off smoker and wrap in foil for 5-10 minutes. Slice thinly and serve with more bbq sauce on the side or with a chutney. Stubb’s! I love Stubb’s. And this looks delicious. But since we don’t own a smoker, can you make it for us? I’m sure we can work it into our busy cooking schedule! Love the fianl pic. Making it tonight with a rub. throw a little beer in the liquid bowl on my elecric smoker. Thanks. Good luck! I’ve not been disappointed yet! I enjoyed your pork tenderloin feature. I’m doing one in a couple days. I placed mine in a brine for a couple days. I realize this probably isn’t necessary, but I’m experimenting. I’m a rookie smoker….just bought a Weber Smokey Mountain Cooker. I’ll be interested to hear how it turns out. When I’ve brined pork chops, they turned out way too salty, but I haven’t brined a pork loin yet, though I swear by brining meats like a turkey. Let us know! Looks good! This is exactly what I was looking for. The meat you used matched what I have. I will try it this weekend. Thanks! Why sauce before smoking? Doesn’t that hinder the smoke from entering the meat? I’ve not had a problem with the smoke penetration and generally have a nice smoke ring. I do it in advance because I prefer the sauce to cook down and blend into the meat, where putting it on at the end tends to overpower the taste of the smoked meat. http://www.thetasteplace.com/2011/07/11/superbly-spiced-smoked-chicken/ ) and simply served the sauce on the side. This is a great recipe. If your smoker has a water bath use apple juice or cider instead of water – you’ll be amazed at the difference. I do that pretty regularly, but not all the time. Sometimes just an 8 ounce apple juice in the water pan, and possibly a quartered onion or some herbs as well. Just got our first smoker and am looking forward to using it this weekend. I’m a little nervous aobut it, but this recipe looks simple and sounds yummy. It really is as easy as it looks. And as you can see from the other comments below, you can use several variations. Sometimes I dry rub it and don’t sauce it at all, sometimes I use just the marinade, sometimes I’ll add sauce in the last 15 minutes, etc. But after about 2-3 hours (3 hours is the high end for a standard loin), it is beautiful! Sounds great. IMHO, you shouldn’t use a wet sauce before smoking. The moisture will hinder the smoke from entering the meat. Same thing goes for the marinade.. I would wrince it, pat it dry and let it sit in the fridge for a few hours to get tacky before smoking. Hi Jeff and thanks for the site and good information. My question is; I want to smoked the loin and then cut up into individual sizes, vacuum pack them, put in the refrigerator and then re-heat the vacuum packs in boiling water in a few weeks at the deer camp? Or should I freeze the packs until time to re-heat at the camp? This would make it very easy to have something good and easy. I don’t have any experience with vacuum packing as a method of preservation, so I can’t really say. I certainly wouldn’t worry at all if it was only being saved a week or less in the refrigerator, but not sure about longer than that. @Debbie–having had your smoker for eight months now, you’re probably a pro. But for anyone else contemplating a first smoke, buy a whole fryer chicken and split it in half. Smoke the two halves with a wireless thermometer (yes, you need one) stuck in the breast or thickest part of the thigh in a 215-225 degree smoker until the meat temperature reaches 185. Remove and foil for 10-15 minutes to set the juices. Takes about 3 hours, and it’s a great first smoke because it’s hard to mess up. WHat kid of smoker do you have? I have a Bradley and was wondering if I should smoke it for the entire cook. What would you rec.? I have both an upright charcoal water smoker and a horizontal with the offset firebox. It really doesn’t matter as long as you keep the temp consistently around 225. As for the smoke, I certainly cook it in the smoker the whole time, but generally only add actual smoke in the first hour or so (maybe add chips/chunks three times, roughly every half hour), as that is generally plenty, whatever you are smoking. I’m smoking about 4 of those tenderloins – to I stay at that 3 hr cook time or should I increase? Assuming you can keep the cooking chamber at around 225 and there is adequate space between the pork loins, you shouldn’t need to have to increase the cooking time. Btw, if the loins are pretty skinny, it can take much less than three hours to cook them through. Use a good meat thermometer to be sure. I’m a new “smoker” (not talking about Colorado’s latest POT law) but recommend you look at Pit Barrel Cooking Co smoker. Amazing and terrific. The meat hangs instead of laying on a grill but you can also grill if you want to. The Company has videos to give you step by step for all kinds of meat,chicken fish etc. Check it out you won’t be sorry. 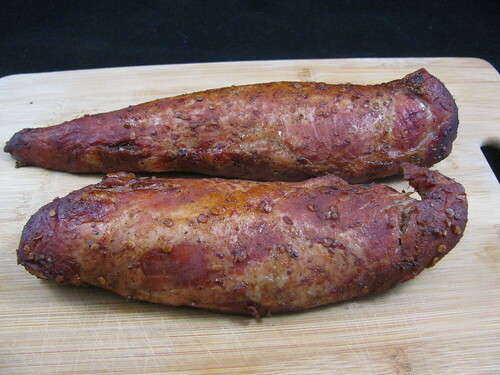 Just bought a smoker and a meat grinder… going to learn to smoke all kinda of meat and make sausage… Yum.. Thanks for all you recipes and sharing your trials and wins. Smoke is attracted to wet surfaces and smoke sticks better to a wet surface. Emeril's Passover Brisket -- Tasty and Tender All Year Long! Emeril's Twice Baked Potato Casserole -- A big time kid favorite! Make-Ahead Individual Ham, Cheese & Veggie Frittatas.